The development of an additive multiple-attribute utility model for the evaluation of two timber harvesting systems for thinning operations in steep terrain under varying stand conditions for uphill and downhill extraction is described. Besides cost efficiency, occupational health and damage to the residual stand and to the soil are considered in the evaluation. The parameters of the utility model are estimated by Saaty's eigenvalue method. Sensitivity analysis is presented as a means to deal with effects of subjective preferences and uncertain expert judgements. From Austria's 3.5 million ha of forest land approximately 25 percent are on slopes with an inclination of more than 60 percent. Timber harvesting operations under such steep terrain conditions rely on cable yarder systems that have proven to be an adequate extraction means. Increasing the cost efficiency of harvesting operations under such difficult terrain conditions is particularly important for thinning operations because in Austria's forests only 71 percent of the annual increment are utilized. This results in thinning reserves of approximately 65 million m3 standing volume. The usual approach to increase competitiveness and profitability is to reduce direct harvesting costs. This cost reduction can be achieved by mechanization of the timber harvesting systems. In Austria, two cost effective mechanized harvesting systems are available for thinning operations in steep terrain (Stampfer, 2000): i) steep terrain harvesters in combination with cable yarders; and ii) chainsaw felling combined with a cable yarder and a processor mounted on the yarder. However, short-term minimization of direct harvesting costs may be counterbalanced in the long term by damage to the residual stand resulting in increased losses resulting from infections by fungi, or by missing protection of human resources. Thus, inclusion of additional evaluation criteria will not only allow for a more comprehensive account of costs and benefits of harvesting systems but also increase public acceptance of timber harvest operations in mountain forests. The application of “classical” monetary evaluation techniques is seriously hampered by the importance of intangibles such as working safety. For evaluation problems, including multiple attributes on different measurement scales that cannot be priced easily, multiple criteria analysis (MCA) techniques are recommended (Mollaghasemi and Pet Edwards, 1997). Though well accepted in industry and business applications, MCA techniques have rarely been applied for the evaluation of timber harvesting systems. In this contribution we introduce a multiple-attribute-utility approach to evaluate harvesting systems for thinning operations in steep terrain. For the multicriteria evaluation of thinning operations in steep terrain, the following harvesting systems were compared: i) steep terrain harvesters in combination with cable yarders; and ii) chainsaw felling combined with a cable yarder and a processor mounted on the yarder. The former is known as cut-to-length system (CTL) where the harvester fells, delimbs and processes the trees and bunches the logs along the cable corridor (Heinimann et al., 1998, Visser and Stampfer, 1998). In this study the tracked harvester IMPEX 1650 Königstiger was combined with the cable yarder Syncrofalke. A boom reach of 15 m allows a cable corridor spacing of 30 m, which makes the “Königstiger” particularly suitable for combination with a cable yarder (Stampfer, 1999). The alternative to CTL is motor-manual felling with chainsaws and whole tree extraction by a cable yarder (whole-tree system [WT]). In this study the cable yarder Syncrofalke is used. At the forest roadside the trees are processed and crosscut by a Wolf processor mounted on the cable yarder. The WT system depends heavily on the goal-automatic of the carriage, which is an essential feature for achieving high efficiency, as it allows the machine operator to use the processor while the computer controls the outhaul and inhaul phases of the carriage (Stampfer, 2000). Both systems can be used for uphill and downhill extraction. In this contribution, the analysis comprises a wide range of harvesting intensities (harvested volume per stand entry), harvested mean diameter (16–28 cm dbh), as well as both uphill and downhill extraction (see Table 1). In the model calculations a maximum extraction distance of 200 m was assumed. Where (a + b + c = 1). Parameters a, b and c characterize the relative importance of the partial objectives U(i). 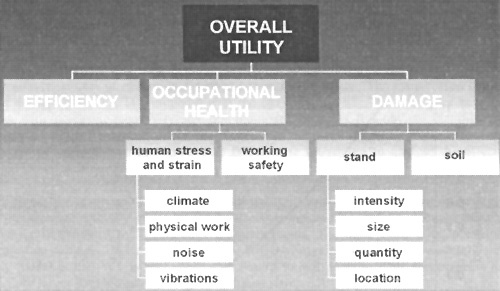 Utility expected from occupational health is composed of the aggregated preferences for an alternative with respect to human stress and working safety (2). By means of a second-order preference function the criterion human stress and strain is further broken down into the subcriteria of climate, physical work, noise and vibrations (3). The partial objective minimization of damage is factorized into (a) damage to the residual stand, and (b) damage to the soil (4). Finally, at the lowest level of the decision hierarchy the preferences for the alternatives with respect to the lowest-level decision criteria were derived. As an example, equations (5) show the approach for the decision criteria human stress and strain mediated through “climate”. Figure 1 shows the complete decision hierarchy for the evaluation of timber harvesting systems. The efficiency of an alternative was measured by the profit contribution (revenues minus direct costs) of a harvesting operation. The ratings with regard to physical work were based on work pulse. Stress and strain through noise were characterized by published values in Decibel, vibrations as published K-value, and climate by the least favourable conditions experienced by the workers within a harvesting system. The parameters of the model were estimated by the eigenvalue method as suggested by Saaty (1977, 1996). Essentially this approach is based on pairwise comparisons of elements in a decision hierarchy with respect to the element at the parent hierarchical level. The pairwise comparisons are made on a scale of relative importance (see Table 2). The ratings are then arranged in a symmetric comparison matrix and the local priorities of the elements in the matrix are calculated from the normalized eigenvector (i.e. the eigenvector with the largest eigenvalue). The combination of an additive MAUT-model with the eigenvalue method from Saaty's AHP follows examples from Kangas (1993), Kangas and Kuusipalo (1993), Lexer et al. (2000), Lexer (2000), Lexer and Jäger (2001) and Vacik and Lexer (2001). To circumvent the restrictions regarding a limited number of alternatives that can be compared, we modified Saaty's original approach. The full possible range of continuously scaled decision criteria at the lowest hierarchical level was divided into seven to nine categories of equal width, and the midpoints of the categories were used in pairwise comparisons as a substitute for explicitly known alternatives. The resulting local priorities were scaled to one, and an equation was fitted to the data points (see Figure 2). Figure 3 shows the efficiency of alternatives characterized by the difference between revenues from the harvested timber and direct harvesting costs. The results clearly indicate that in stands with low mean dbh of harvested trees it is difficult to get positive profit contributions. The turn around occurs at diameter dimensions of 19–20 cm. In small timber, WT is less competitive. The cost difference between uphill and downhill yarding apparently is fairly small. Figure 3. Direct profit contributions of WT and CTL systems, uphill and downhill, at harvesting intensities of 100 m3 per stand entry at varying mean harvested dbh. Figure 4 shows the expanded utility-based evaluation with the MCA-model, including occupational health and damage. Under a rather conservative parameter scenario (compare Figure 4) the CTL system is always preferable regardless of extraction direction and stand dimension. The main reason is the ergonomic advantage of the harvester in CTL compared with the chainsaw of WT. The difference between CTL and WT decreases with increasing mean harvested dbh (compare Figure 3). It is obvious that this result is based on subjective preferences regarding the importance of the involved objectives. Damage is more or less irrelevant in the scenario shown in Figure 4. It is therefore interesting to analyse the effect of varying preferences on the evaluation result. Figure 5 shows the response of expected overall utility to increasing importance of damage. Under the assumption that damage is totally irrelevant for the decision-maker, CTL in large diameter stands is the most preferred alternative followed by WT in large diameter stands. The other extreme is an evaluation that is entirely focused on damage. Under this assumption, WT is always preferable. The reason for this behaviour of the utility model is that WT is preferable with regard to soil damage. This advantage is not offset by expected slightly larger damage quantities in the residual stand. With growing awareness that short-term cost minimization as the only evaluation criterion might not be an appropriate optimization approach in forestry, the development and testing of methods that allow the inclusion of other criteria gained importance. MCA (here we use MCA as a generic title for all kinds of multiple criteria, multiple attribute and multiple objective methods) provides the framework for an appraisal approach which allows the combined use of valuation techniques, such as cost-benefit-analysis (CBA) or net present value techniques (NPV) from microeconomics. The need for such an integrative appraisal approach is because of the shortcomings of techniques that try to evaluate monetarily intangibles (e.g. occupational health). MCA takes a set of alternatives/scenarios, a set of objectives to be achieved and a set of criteria by which to measure each of these objectives. The impact of each alternative/scenario on each criterion is assessed. Through a formal process it compares these individual criterion impacts in order to evaluate each alternative/scenario and select the best with regard to the objectives. Besides the inclusion of intangibles, one important point is that, because of different value systems of individual decision-makers, usually no single best solution exists. In order to assist in the decision-making process, evaluation techniques thus have to consider the value/preference system of the involved decision-maker. This flexibility might be criticized. For benchmarking of timber harvesting systems a generally accepted “value system” (i.e. a standard set of model parameters) is needed. One possible approach to derive such a general parameter scenario is to utilize group decision-making techniques to synthesize preferences from a panel of decision-makers, stakeholders and experts. One important asset of formal decision analysis techniques is the possibility to assess the sensitivity of the evaluation results to possible changes in the preferences of the decision-maker or to uncertainties of expert judgements. Heinimann, H.R., Visser, R.J.M. & Stampfer, K. 1998. Harvester-cable yarder system evaluation on slopes - a Central European study in thinning operations. In Proceedings of the Annual Meeting of the Council on Forest Engineering Harvesting Logistics: From Woods to Markets. Schiess and Krogstad (editors). 20–23 July 1998, Portland, Oregon: 39–44. Kangas, J. 1993. A multiattribute preference model for evaluating the reforestation chain alternatives for a forest stand. For.Ecol.Manage. 59: 271–288. Kangas, J. & Kuusipalo, J. 1993. Integrating biodiversity into forest management planning and decision-making. For.Ecol.Manage. 61: 1–15. Lexer, M.J. 2000. Ein multi-attributives Nutzenmodell zur Unterstützung der waldbaulichen Planung dargestelt am Beispiel sekundärer Fichtenwälder. Forstw. Cbl. 119: 377–394. Lexer, M.J. & Jäger, D. 2001. A multi-attribute utility model to support silvicultural decision-making in secondary Norway spruce forests. In Dellmann, K. (ed.). Proceedings of the Sixth International Symposium on the Analytic Hierarchy Process ISAHP 2001. 2–4 August. Berne, Switzerland. Lexer, M.J., Vacik, H., Hönninger, K. & Unegg, F. 2000. Implementing a decision support system for silvicultural decision-making in low-elevation Norway spruce forests. In Klimo, E., Hager, H., Kulhavy, J. (eds.). Spruce monocultures in Central Europe - Problems and prospects. EFI-Proceedings No. 33, p. 119–134. Mollaghasemi, M. & Pet-Edwards, J. 1997. Making multiple-objective decisions. IEEE Computer Society. Technical Briefing. Saaty, T.L. 1977. A scaling method for priorities in hierarchical structures. J. Math. Psychol. 15: 234–281. Saaty, T.L. 1996. The Analytic Hierarchy Process. RWS Publications, Pittsburgh. Stampfer, K. 1999. Influence of terrain conditions and thinning regimes on productivity of a track-based steep slope harvester. In Proceedings of the International Mountain Logging and Tenth Pacific Northwest Skyline Symposium. Sessions and Chung (editors). March 28–April 1, 1999, Corvallis, Oregon: 78–87. Stampfer, K. 2000. Efficiency of mechanized steep terrain harvesting systems. In Proceedings of the 23rd Annual Meeting of the Council on Forest Engineering and the 81st Annual Meeting of the Canadian Woodlands Forum, Technologies for New Millennium Forestry. CD ROM. September 11–13, 2000, Kelowna, British Columbia, Canada: 4 pp. Vacik, H. & Lexer, M.J. 2001. Application of a spatial decision support system in managing the protection forests of Vienna for sustained yield of water resources. For.Ecol. Manage. 143:65–76. Visser, R. & Stampfer, K. 1998. Cable Extraction of Harvester-Felled Thinnings: An Austrian Case Study. Journal of Forest Engineering, 9, 1: 39–46.